Here’s the thing . . . I’m hungry – Time for some Complexity Consciousness for lunch. I’ll have the Quantum Burger with the Chaos theory salad and an extra layer of System Theory thanks. Coming right up Madam. CHARLIE! Another Quantum Burger with the LOT. As a young tail-end boomer growing up in the 1960’s there was nothing quite as amazing showing in the electronic community theatre (AKA as Television) as Star Trek. Captain James T Kirk and the voyages of the Star Ship Enterprise was indeed the coolest thing on TV, and of course the rest of the cast with him. The unforgettable Vulcan – Mr Spock, ship’s doctor”Bones” McCoy, the engineer Scotty, Uhura, Sulu, Checkhov and the rest. By today’s standards it was fairly simple. Back then it was incredibly cool, sophisticated and futuristic. What was so amazing about Star Trek apart from the groovy sets, cool technology and neat uniforms was that here was a glimpse of the future that presented an inspiring vision of what we could become. Development was defined not in terms of how much stuff you could amass but how much self-development you could achieve. The future world inhabited by Star Trek was one in which people had all the material things they needed and had aspired to. Material poverty was shown as a thing of the past. What had come to define development in the Star Trek future was not the number of shopping malls, factories, housing estates and all that stuff. Booooring. 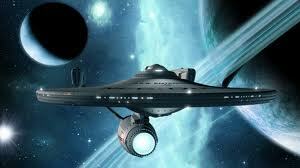 Star Trek advanced the ideal of the inner journey to the masses. The idea that you didn’t need all the stuff had emerged from the culture of artistic and intellectual hipsters. The beat generation – the likes of Jack Kerouac, Allen Ginsberg and William S Burroughs and hothouse intellectuals such as Abrahm Maslow were delivering a seditious message. You don’t need to be materialistic to be happy. Star Trek had taken that avant garde idea and turned into a hit TV show. It was Lost in Space on acid. What replaced poverty as a challenge for the times was what psycholigist Abraham Maslow called Self Actualization (he later added self-transcendence) – the top part of Maslow’s pyramid. Here we have the self-actualizing human represented. Well . . .it’s a beautiful thang. This was originally proposed by Maslow in a 1943 paper titled: A Theory of Human Motivation. Rather than studying mentally ill or sick people, Maslow looked at highly successful people like Albert Einstein, Eleanor Roosevelt and the healthiest 1% of the United States College population. Maslow’s gift to the world has become known simply as Maslow’s Hierarchy of Needs. It goes like this. The hierarchy is usaually portrayed as a pyramid. At the lowest levels are basic physiological needs, things like air, food, water, shelter and clothing. Without these things the body just can’t function properly. If people don’t get these needs met it’s hard to move up the scale to Safety needs. These are; Personal security. Financial security, Health and well being, safety against accidents and physical danger. Higher again on the scale of self are drives of love and belonging. This third layer deals with more complex social and inter-personal feelings and leads to the social drives – what Maslow called Belongingness – friendships, intimacy, family and groups. This can be expressed in small groups and also with larger social, work, spiritual (church), community and all manner of socially dynamic groups. What is critical to understand about Maslow’s hierarchy of needs is that in general people tend not to move UP the scale to get their higher order needs met, until the basics are covered. Hence at the very top of Maslow’s pyramid in the self-actualization and self-transcendence areas are the levels that people can more freely explore once they have the basics met. It’s a pretty safe bet that Gene Rodenberry – the genius who dreamed up Star Trek – was familiar with Maslow’s work. There’s a nice neat little equation here which would be . . .The degree to which we become stuck in the glamours of material possession is the degree to which we either limit ourselves or remain in avoidance around the higher levels of human experience. These are – Self-actualization and self-transcendence. So what are these things? Furthermore what do they have to do with sustainability? This does claim to be a blog about sustainbility afterall. Yearp . . .good question. Here’s the thing . . . I’m hungry – Time for some Complexity Consciousness for lunch. I will have the Quantum Burger with the Chaos theory salad and an extra layer of System Theory thanks. Coming right up Madam. CHARLIE! Another Quantum Burger with the LOT. As a well fed, well educated. intellectually hip memeber of the funky western civization, you, yes YOU, are now responsible for the future of the world and how it unfolds. As you let go of the need (and the fear) to amass yet more stuff and begin to more resolutely ACTUALIZE yourself as the person you conceive yourself to be . . . you create a whole new matrix of expanded self-hood that will be instrumental in transforming the world. There are things you are going to want to do to help the world. Then DO THEM. You will not have an internet account that you can log into to see the numbers of people that your own personal achievements of self-hood touch, influence and transform. Nevertheless you will FEEL the waves emanating from yourself and feel them reinforced by the bio-organic feedback loops that are an integral part of your own expereience, beingness, your own consciousness. The established patterns of your own transformed self-consciousness will become integrated with the global avatar. In purely scientific terms, the transformative pattern that you express into the deep energetic ocean of the Quantum Holographic Universe is capable of drawing to itself a coherent system which is connected via fractal motion – with the entire universal hologram. This is what happens when you function as an attractor state. That, and you become an energetic part of yet other functioning systems that are in turn the flowing energies of the new order emerging, stabilizing and manifesting. Your pattern does both for it is hyper-dynamic. It attracts to itslef and it is part of the attractor. What is known in Chaos Theory (the Butterfly Effect) as an attractor state . . .in this case for global change is already picking up speed and force. You are the butterfly flapping it’s wings that is creating the cyclone of future change. And just like a cyclonic weather system out over the ocean – the changes to come . . . the attractior state is still gathering to itself the atmosphere that will become the cyclone in full – and as we have seen hinted at even terrifying – motion. Except this one is shaping up to be the Meta System transition. The perfect storm of global change. What you are seeing with the instabilities around the world . . this is just the warm up show. EVERYTHING is about to change. Gee . . .everything? At the end of each episode of Star Trek there was always some profound sense that having overcome the big challenge they faced, the entire community of the Enterprise had somehow been resolved of the crisis and ready for the next adventure. Do you remember how the show always started? Despite the phalocentric language it’s still a crowd pleasing favourite. It was always the same universal constant. The start of each new cycle was to set the stage for the great adventure. Dr Quantum says: Time to activate Code Green and you will boldly go. Code Green of personal development and transformation. Code Green the transformative energies that will be a living part of a transformed future. What are those transformative energies? Well . . .you tell me. You are after all . . the captain of the ship.